Scott and Ally Svenson weren't planning to become entrepreneurs again. The husband-and-wife team had already created two food empires: Seattle Coffee Company, which they sold to Starbucks (SBUX), and Italian restaurant chain Carluccio's. They thought they were done. "My wife said, 'the last thing the world needs is another restaurant chain,'" recalls Scott. But the prospect of shaking up a $40 billion market, and doing some good at the same time, proved irresistible. 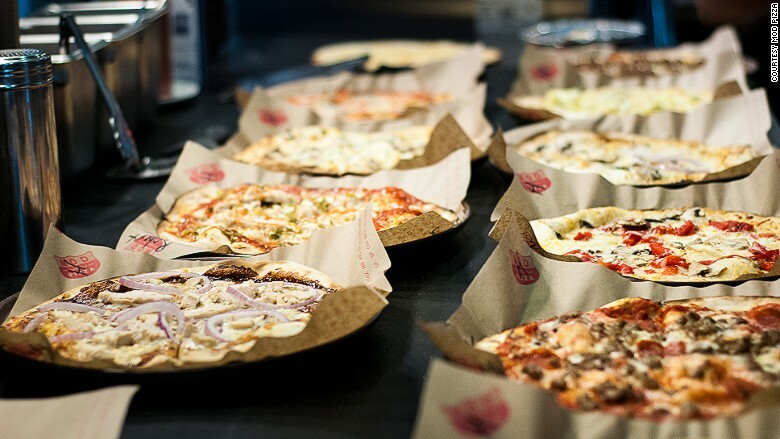 They launched MOD Pizza in 2008. It's now the fastest growing restaurant chain in the U.S., according to Technomic's Top 500 Chain Restaurant report. "We spent a bit of time sitting around the dining room table, talking about, 'is this something we want to do, and what would make it worth the time and energy for us?' That's when we walked into the idea of making pizza a platform for positive social impact," says Scott. MOD is trying to fill a gap in the market between deliveries from Domino's or Papa John (PZZA)'s and a full restaurant experience. Its model is similar to Subway and Chipotle (CMG): customers can add as many toppings as they like to a thin-crust base and walk away with a pizza three minutes later for just under $8. "It's a very fast experience, and you get a freshly made product at a great price," says Scott. 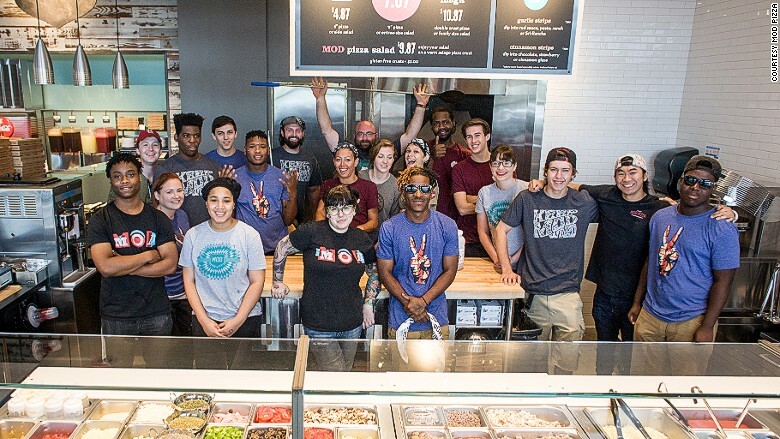 MOD Pizza believes in paying its employees a fair wage. He's also selling "enlightened capitalism." MOD Pizza pays at least $10.50 per hour. Every employee -- or MOD squader as they're called internally -- gets full healthcare insurance, paid time off, and access to an emergency fund that offers grants and loans. It's a benefits package beyond the dreams of most part-time workers in the hospitality industry. "Something like 50% of the workforce, if they have an unexpected $500 expense, wouldn't be able to cover it," says Scott. "They literally live pay check to pay check. We wanted to make sure our employees had a place to turn to in a time of crisis." The company also hires people most employers ignore: ex-convicts. Many of the former felons MOD hired have gone on to become store managers and passionate brand ambassadors. "Some will say, 'you can't give the keys to a convicted felon.' What we say is everyone makes mistakes, we're all human, and if you're really trying to do the right thing, we've got your back. We'll stand by you," says Scott. Neighborhoods benefit too, he says. Every time a new MOD store opens, the company donates 100% of its proceeds from the first day of trading to a local community charity. "It's a selfish act in that it makes my wife and I feel good to build a business that makes a positive impact," admits Scott. "But we've discovered that it's also a more powerful business model if you give people something to work towards that is more than just a pay check."